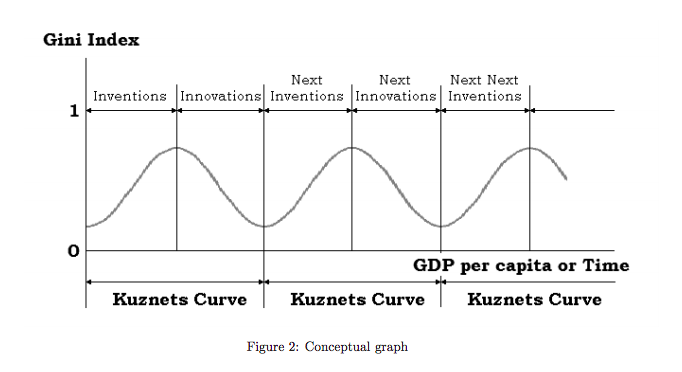 The Kuznets curve, a hypothetical inverse u-curve graphing economic inequality against income/capita over the course of economic development (time), while an interesting concept, has been criticized for the weakness of the data used in the analysis. Simon Kuznets himself admitted to this weakness, he’d used data from countries where income inequality was outside of the bounds of average. The hypothesis, developed in the 1950’s and 1960’s, has also failed to account for the rapid economic growth and, consequently, growth of a middle class (China being a great example). “First-generation tech usually causes ‘net negative’ social effects; second-generation ‘net neutral’ effects and by the third-generation of tech — once the tech is smart enough, and we’ve got the interface right, and it begins to reinforce the best behaviors — we finally get to ‘net positive’ effects. Even as incomes rise for workers in the US, “stagnation of wages at the bottom of the US wage distribution over the past several decades and continuing low rates of full-time work, especially in single-parent households, often leave families below the official poverty threshold” leading to a condition of the working poor. Living above the poverty line and (more aspirationally) the accumulation of wealth — a stock of assets accumulated over time, providing its owner with a foundation of economic well-being- a cushion in the event of short-term economic shocks, funds to purchase big-ticket items a source of retirement income, and social and economic capital to pass to one’s children/grandchildren- are just pipe dreams for a huge chunk of the population (no matter how you slice and dice it). Using artificially intelligent products, the companies that will thrive over the next few years will, by fully understanding the customer's context, assist their customers (some of whom work more than 50hrs a week) to slowly but surely move out of the poverty. And, utilizing fancy algorithms that currently help the wealthy get wealthier, some of these products will actually assist their users in accumulating wealth. learns your desires/needs because you’ve personally trained the AI. Instead of the current model where facebook decides what I see by using what I’ve done. and consequently collects payment on your behalf from any company that wants to get the benefit of your attention. As Nobel prize-winning social scientist Herbert Simon suggests ‘In a world of abundance, the only scarcity is human attention’. It’s time for companies to pay for our attentions. I traveled to a few places I’d never been before in 2017. Like many travellers I know, I love to experience the peculiarities and nuances of any new city/town while also yearning for some familiarity in the things that I seek out in these new locations. The problem is that most of these cities are starting to look Exactly. The. Same. Every Starbucks has baristas that make your drink, for the most part, exactly the same. The hotel rooms are the same in every city. Exactly the same. Even the bedsheets are folded the same. Traffic is gnarly in the middle of the city. Despite the congestion zones. And people are driving the same cars. Busy professionals in these cities now dress the same. Even in their attempts to be unique we all now shop in ‘local stores that have global locations’. And we all don’t seem to see the irony of that phrase above anymore. This sameness became standard for most cities in the US once suburbia became desirous. But people are now yearning for more authentic ‘place’ experiences. Unfortunately, smart cities (with technology overlaid on everything) will further accelerate this move to sameness. Airbnb was providing this authentic experience of a new place through engagement with locals but, in their need for growth, they are pretty much now building hotels! I don’t know if it’s virtual reality that’ll get us there, but I hope not. It would be a shame to lose the humanity, quirks and all, behind the experiences we share with people. Technology has driven us further apart in our desires but much closer in how frustrated we are about the state of things.That’s why, despite all the pessimism around tech, I hope we can start using our tools to solve the real problems we have.